It was too hard to take my photo today. I am going to describe my meal instead. We always have the same trays. On it today I had fish, chips and peas with a yoghurt and some water. The fish was golden brown and very crunchy. It was the the size of my hand but thinner. The fish inside was white with bits of brown and grey. We don't get vinegar or salt only tomato sauce which is served to you on a spoon. I ate my chips with my fingers and dipped them in the ketchup. The peas are hard to get on your fork so I stabbed them. 'Our school is from eight o'clock till one or two clock most days. Sometimes we have afternoon classes. Some pupils go to after-school care and only these eat at school. There is either salad or soup, and always a dessert. Dessert is sometimes fruit, but we always get fruit one hour after lunch. 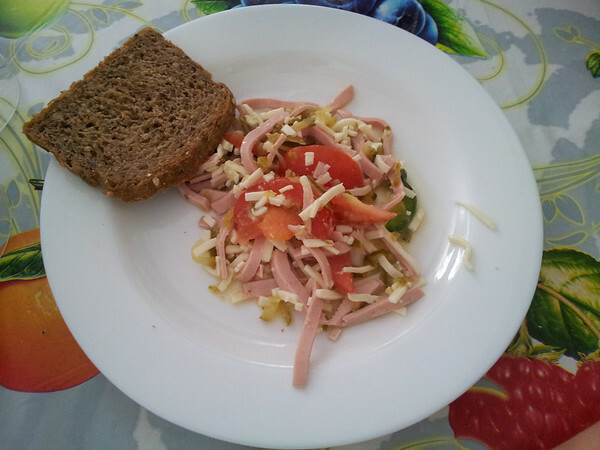 This is Tuesday's lunch "Wurstsalat"
It's sausage meat mixed with tomato, cheese, lettuce, gherkins. Dessert was a raspberry pudding, but we don't have a picture of it. Your bread looks really dark and I like your Wurstsalat but it's really expensive! I am planning a Porridge Party if we manage to raise over £100,000 for Mary's Meals. We are really close now so I hope we make it over the weekend! School holidays start soon here in Scotland. We are looking for schools from around the world to guest blog on NeverSeconds and show us their daily dose of school dinners. For one week it's your chance to show us what's important to you about your lunch. If your class would like to take on the challenge please get in touch with NeverSeconds@gmail.com . Many thanks! At your school can you not have fresh fruit unless you finish your meal? Is this true? Fruit is an important part of any diet. Do you rarely choose fruit? Or perhaps there's simply not enough fresh fruits for every student and so it is presented (or withheld) as a treat for those still hungry? Even after sweets? If that is the national tradition, so be it? I would send you a picture of what I ate today but it was too embarrassing (not fruit). Thank you, good luck, and take as many days offline as you like. Live your life. I'm very proud of you, and hope your hand feels better! I was confused about that as well. In one of the blogs she mentions "no fruit since I didn't finish my dessert" and I thought that was sort of a shame, since it would be more nutritious for students to eat fruit over some chocolate Australian Crunch bar..? That seems awfully backward to me! So VEG - whatever you decide, or not, to do next, or not, continue to enjoy being a kid. Study hard. Play hard. Live well. Eat well. Thank you! Goodbye. Congratulations on getting to £100,000 Martha! Enjoy your party! WOW!!! Porridge is on the Menu you have hit the £100000. Oh my goodness! Have you seen the £3000 donation that has taken you over your £100.000 mark? Well done! I request you please also help this project to give a meal and education to the unfortunate children in India. Keep up your good work. Wow! £3,000 donation by one person ! Amazing ! Ignore me previous post, you had already made the £100k ! Well done ! What is a Porridge Party like, please? Congrats on the 100,000 mark..
WAY TO GO!!!! Keep it up Martha.. you've still got a lot of steam stored up there...could go higher still.. Let's hope it does..
Tell your friends... spread the word everyone..
No vinegar on chips! Oh dear! I can't eat mine without a splash of sarsons! Congratulations! You did it! What an amazing achievement for anyone let alone someone as young as you are. Well done you! Please keep your brilliant blog going for as long as you can. It makes others think seriously about what children are eating at school. This is such an important topic. I became interested in what schools were serving back when I was 11 back in 1971 (many, many years ago!). We had what I guess you might call "Junior Dinner Ladies". Where I lived (La Jolla, California in the US) children in grade 6 at my elemantary school were offered the chance to work in the school cafeteria during lunch - serving the meals and doing the dishes. I did so for most of the school year, usually one or two days a week. For our efforts we got our lunch for free and got an ice cream bar for pudding. We were also allowed to leave class early for lunch and went back to class when were finished working, missing at least half an hour. Always appreciated! Lunch was a main dish with one or sometimes two vegetables, something starchy (bread, potatoes, rice or pasta) and a pudding. The only drink allowed was plain milk which we had to finish. They even had milk monitors to check that you drank it all! If you didn't you weren't allowed to leave until you had finished the carton. On Fridays you could buy an ice cream bar but we were given one whenever we worked in the cafeteria. I was allowed to sit in a meal planning meeting once - probably because I never stopped asking questions about what was being served. I can happily say that we all wore hair nets and I rarely found a hair in the food! Very glad to apprciate Martha for her valuable efforts to feed the children through her bog. Really wonderful and the blessing and paln of our lord. I am realy apprciate and tears on my eys to see her blog every day. At the same time I feel very bad on me that I am working for the children in India and trying to get support from the people but very difficult to get. Now I am realy get confidant realistion with Martha and enhanced my efforts. I request you please see our casue also which is in Gloabl Giving/ just gving to give a meal and education to the needy children in India. Congratulations on reaching and overtaking £100,000. Great achievement allowing Mary's meals to feed more children. Thank you Veg you are a star. BBC news just posted this a few minutes ago..
Why was it hard to photo today? My congratulations to you and your dad on now raising in excess of £100,000!! You probably don't fully realise what brilliant work you have done on so many levels, or how the simple premise of your school dinner blog has touched so many people, and will go on to touch so many more. Congratulations Veg. How amazing to reach £100,000. Well done from the Robertson family. "Pieces of hair - 0" is always nice, but from experiance working in a busy kitchen for a few years. Much of the hair people eating a meal find in their food it actually their own! It falls into their meal from their head/eyelash/brows as they eat it! Someone sent a meal back to me once with a long black hair in it. As my hair is brown, and gets shaved if it gets over 10mm long, and the waitress was blond, it seems unlikely it was mine or the waitress' hair, but the family did have a daughter with them, and she had long black hair....But would they believe it? No. Congratulations on hitting £100,000 too - you've done a fantastic job! but it keeps them on my knife! I'm totally amazed by what you have created here, VEG, first the blog, then the inspiration for so many people to donate so much money to such a great cause. Wow. Well done, you. Neverseconds but foreverfirst. Well done Martha. I am a daily visitor to your blog and like seeing what people eat elsewhere. Perhaps over the holidays we can see what you eat at home. Try helping your mum or dad prepare the meal. This is what millions of girls your age will doing every day. Many congratulations on reaching £100,000. And congratulations to everybody who has given whatever the amount. I like your word picture of your meal at least as much as a photo. I can easily see it in my mind from your description and thats a better picture sometimes than any photograph. Keep up the good work but remember to enjoy your holidays as well. Have a great party, you all deserve it, lets keep this rolling along the Sash Window Repair Man company will be following this. From the staff and crew here in Brighton. Martha, again well-done on everything. It was an absolute pleasure to donate to your cause, and utterly demolish that 100.000 barrier. I hope the news companies carry your 100k success and more donations continue to pour in over the weekend. Enjoy the party you deserve it. Many thanks! Mary's Meals will really make a huge difference with your donation. Your blogging efforts and contribution to Third World nutrition are inspirational. Congratulations on reaching your incredible donations. Martha, was it hard to take a photograph because your arm is hurting? You have done so well to raise so much money for charity. Well done. I hope you are as pleased with yourself as everybody else is. Congratulations on making the £100,000 mark! Brilliant. Wow! £100k. Enjoy your porridge, you've earned it. My children broke up for the summer holidays today (8 weeks in Stirling!). So we celebrated after swimming lessons with a carry-out fish supper. But we tried a new chippy, and it wasn't as good as the usual one. It's interesting that something as simple as fish and chips can be so different, depending on the way it's cooked and the quality of the ingredients. Our battered fish had been sitting in the heater for quite a while so it was quick to serve but had gone dry and the batter was really thick and crunchy. In fact my 5 year old couldn't cut it by himself. I think this is probably the problem with your school lunches. They look fine on the menu, but the reality is lacking in quality and tastiness. Enjoy your last few days at school. Nearly summer hols. one news about u in brazilian site. I'm from Brazil and saw your blog while reading the newspaper. Congratulations for everything: your blog, the donation, the change in your school...! I'm really impressed that you, a 9-year-old girl, could do such a thing! Thank you very much, and I'm wishing you all the luck in the world! Last week, I kicked this story to the BBC and Twitter at about 8:30am and by the end of the day I was in tears of joy about how many people responded. This week I am still in tears of joy at how much you have raised in a week. I hope it just continues. It makes me feel that people are in the main are decent and it just takes a little girl in Scotland to touch peoples hearts all over the world. Thank you somuch for you apprciation to Martha. Really wonderful that she did. I wish to request you also, is it possible for you to suport our cuase in India to give education and a meal through just gving. That will be great help to poor children in India. We are struggling to get a best fundrsing volunteer for our project. Please help us. Thank you so much! I must say, it is quite ridiculous how addicted I am to your blog! I read about it on the Huffington Post and now I check it every morning (and I checked it again just now and was excited to see a fresh post!) I am a professional fundraiser in Milwaukee, Wisconsin, USA, and I am just thrilled that you are using this blog to raise money for such a worthy cause. You have a bright future in non-profit management. Since the council gave you trouble about taking photos, it would be nice if you could clarify the reason taking photos was too difficult today. Was it because of your stookie? If that's the reason, we all hope your arm will be better soon. We also hope there is no other reason! Whaaatt is a porridge party????!!!!???? Btw yes I know I keep commenting... Congrats btw on the 100k!!! <3 ur work!!!! Keeps it going ano it's the summer hols but don't forget to blog after the hols!!!! So happy that you continue to blog. Just read up on your latest posts. Congratulations on blowing past your fundraising goal! You've made quite an impression on millions of people around the world. Well done! My daughter is out of school for summer, but is attending a day camp. The local school district is providing lunches for the kids, but I pack a lunch for my daughter instead. I've just read on BBC news about you raising £100,000 for Mary's Meals! WOW!!! 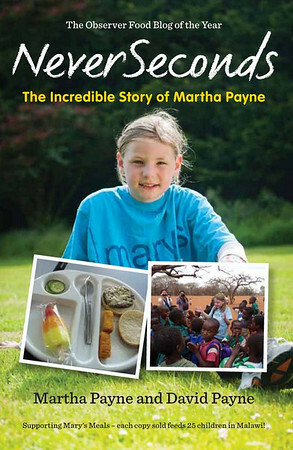 Really wonderful and very great that you helped the children in need through Martha. Thank you sooooooomuch. Please see the cause in the following links. I wish you to keep up the good work and god bless you and Martha. What a fantastic achievement to raise a £100,000 to change people's lives. I've loved reading your blogs and I hope you will continue to find ways to write about your life and your achievements. I have a suspicion that you are going to lots more to say! CONGRATS Martha! Well done. You have raised £100,000 for Mary's Meals. The world need people like you. I'm so so so happy for you. You done a great job! Veg, you are BRILLIANT! I love reading your blog. I hope you grow up to be a food critic. More people should review restaurants the way you review your school dinners! I've nominated you for an Illuminating Blogger Award (http://foodstoriesblog.com/illuminating-blogger-award/), because I think your blog inspires and teaches us so much. Keep up the good work! Well done Veg, breaking 100k is remarkable. You restore my faith in humanity and remind all of us that when people come together we can do really great things. I think there are a number of adults who could learn by your example. Keep up the good work! You're right that there are a number of adults who could learn from Martha's example. What a fantastic achievement. An amusing blog that encourages international awareness and communication, and raising so much money for a very worthy cause. Everyone's a winner. Don't forget to thank Argyll and Bute Council for the advertising. Have to say, your food looks so much more appetizing, varied and healthy than what I faced in the '60s and early '70s. No seconds either. It's nice to see the improvement. Carry on, good luck, and enjoy your porridge party. Hi Veg, I hope you have a great summer break. I work for an NGO in San Francisco (Project Open Hand) that provides meals to people who are very sick and home all by themselves. I'd be so excited to take one of the weeks and send pictures of the meals we send to our friends who are hungry. What do you think? Great to see the total pass £100,000 and it's still growing. Keep up the good work, but don't over do it. Hi, I'm a Brazilian girl, and it's incredible. You are brilliant, your blog is unavailable. Congratulations by donations. Hello, my name is Vinicius, study in a Public School in Brazil, I read a news site here that you were looking for people from other countries to photograph the meals here, and I think this a great opportunity to publish the wretched meal that Dan here , My email is: vgobira@hotmail.com, I would be grateful if you reply ..
U r an inspiration to many and i hope u will keep going like this and may b it can become something really big and helpful later for unfortunate people of the world.This world is becoming a more unfair and cruel place everyday and is in need of angels like u.
I wish my daughter will grow up to become a martha payne. Well done, Veg. A major achievement. hi my little friend. i am Faezeh. i'm a reporter in Iran. i saw your beautiful Weblog. i use it in our news agency too as another my coworkers in other country. For me, the best thing about this blog has not been the heightened awareness of bad school food, the Davida-Goliath fight or the funds raised, wonderful as they all are; it has been the contact with other children around the world. Veg has not only guaranteed herself an A* in GCSE Geography, but she is creating ties with all kinds of cultures, and anything that unites us has to be a good thing. Hello, my english is not very good. A french magazine wrote an article about you and your blog, It's Grazia n°145. I just want to talk to you that. Congratulations for raising over £100,000 for a great charity. Well done you!! Keep up the hard (but great) work!! One thing I’m seeing in these comments that is giving me pause is that I wonder if people are losing sight of the fact that Veg is just 9 years old. I see people telling her that she should be a professional fund-raiser, or a professional food critic, etc. I don’t know about the rest of you, but I changed my mind about what I wanted to be when I grew up quite a few times between the age of 9 and when I actually had to make a decision about that. In fact, I've even made a couple of major career changes as an adult! Veg has been quoted (a couple of times) as saying that she thinks she might like to make a career as a journalist. Might we please allow her that ambition rather than offering our own suggestions for careers? I’m actually quite impressed by a 9-year-old keeping up a daily blog for two months. I would respectfully suggest other readers try to hark back to when they were nine years old and ask themselves if they really thought they’d have had the “stick-to-it-ivness” to maintain a 5-times per week blog for that long. I thoroughly enjoy reading Veg’s blog each day as much as anybody else. But I also try to keep her age firmly in mind, and understand that it’s totally unreasonable to expect Veg to keep doing this for years. In fact, once Veg and Veg-Dad have their meetings with the council/school and get some changes made regarding school lunches, I highly suspect that Veg will decide that her “NeverSeconds” blog has accomplished its purpose and will move on to other things that interest her. While she most definitely is an incredibly intelligent, articulate, and socially conscious for a 9-year old, she is still a child. So I beg you, her loyal readers, to please remember her age, and allow her to do the things that other 9-year olds do. Don’t attempt to lock her into a career choice (particularly not one of her own choosing) at this age. Don’t try to “guilt” her into continuing a daily blog after she’s made the changes she hoped to accomplish. I have to say I agree with the above. Whilst continuing to fully applaud Martha for her work and the raising of both awareness and funds - we all forget the price there is to pay for making this happen. Whilst it would be good if Martha can continue this blog in some way that she is happy with - she has made her impact now and should be allowed to return to a "normal" less hassled life (and her family). Hopefully the furore will settle and this will be something that Martha will be able to look back at with a smile and a sense of pride in her achievement. And maybe - one day - as a fully fledged journalist, she will write about what it was like to be catapulted to fame. That is, of course, as the previous writer says..she decides at age 18 that she still wants to be a journalist! Take care Martha and family and enjoy your summer holiday. Thanks for your kind thoughts and great understanding of 9 year olds. Martha is keen to do many things and I am so proud of her sticking to her blog until the end of term. Her enthusiasm for food and interest in what other children eat has grown hence we will have guest schools blogging here from around the world. Thanks again for all your support both of Martha and Mary's Meals. I'm so impressed by your blog! I love the idea and also love how you're raising money for Mary's Meals! Hi Martha, I have been on holiday in Scotland until today and watched all the news coverage of your blog with interest. I am a Rotarian in London and have been involved with our Young Chef competitions which get children to cook a cheap, nutritious meal. I am very impressed with your blog, so much so that I have started my own! I will take a photo of my meal at my Rotary meeting on Monday and share it with you! It looks like you'll be having that party, you're a wonderful girl! One person truly can make a difference! "If you could realize what we eat here in Brazil"
Your endeavor is certainly commendable and huge congrats on the amount of money you've raised. There are not enough young people who get out and do things as you do. Would you be interested in writing a piece on the Manic Thought Society on the standard of school meals? Not complaining, but I keep noticing peas in your lunches. The transcendent popularity of peas baffles me. Mahatma Gandhi once said: "you must be the difference you want to see in the world". Your blogging routine is making some noise, congratulations! The fact that you are trying to visit Africa is really noble, but the poor condition on the food served to the schools has more to do with the local corrupted system than anything else and it is more or less relevant depending on which country you are. In Brazil, for instance, the food is barely eatable. News keep breaking stating that all across the country the schools are serving expired food to its students. Africa shouldn't be very different from here. Watch out there, and keep up the good work. Perhaps one day I'll have a daughter with your reasoning! I was at the Britmums Brilliance in Blogging awards this weekend and I chatted to a fellow mum about your blog. Keep it up, it's bang on what people want to be reading about! If you don't get enough guest posts from other kids around the world, I'd be happy to come up with a meal costing less than £2 which is nutritionally balanced. I'm sure a lot of other bloggers would be happy to do the same to keep your excellent blog going! Veg has announced her impending retirement. It would be my hope that Veg doesn't let go of her blog entirely. I know it's named "NeverSeconds", but that's just because it started out being about school lunches. That doesn't mean, however, that Veg could never write about anything else. I adore Veg's writing style, and would love to see her occasionally blog about things of interest to her, as she felt the inclination to do so. Certainly not every day, or even every school day, as she has been, but occasionally, when she feels she has something she’d like to share. I believe I read somewhere that the Payne family was going to make a trip to Malawi to see the new “Friends of NeverSeconds” kitchen. It would be wonderful if Veg could post a few photos of her trip and tell us about the new kitchen and the students the money she raised will be feeding. But then, that is my wish. It may well not be Veg’s. And, at her age, enough decisions get made for her that Veg should consider herself perfectly free to pursue her own dreams and wishes. Veg, I know this doesn’t mean much to you right now. But I hope that, when you get a bit older, you’ll look back on this and understand that you, in fact, were “the change you want[ed] to see in the world.” That one voice, even the voice of a child, can make such a vast difference. That you inspired thousands more to follow your lead. And that you handled all of the media attention (both good and bad) with a grace far beyond your years. We have been tremendously privileged to witness this small part of your life. We thank you, and we wish you all the joy and happiness that life can bring. I too want to thank you. I would like to second what Jaylah has said. would like to congratulate for your initiative and get on with it. "@rue89 Demandez à vos enfants de prendre en photo leur repas à la cantine, envoyez à muntersinger@rue89.com (âge , prix du repas, école et commune)"
Just thought you might like to know, that the canteen at the college I teach in in Copenhagen, served up left overs from Friday's graduation dinner to the teachers for lunch today. First I want to congratulate this little girl for her work with this blog. I would ask all people of the world to access my blog. The address is gauchaopina.blogspot.com. There you will find news from around the world. Come in, please. Congratulations again child. Will the Forbes Top 10 can do better?? You have a really nice blog! I have one too, but I dont now how can I do this background with the cheese and the carott. How can I do it? Something you may wish to try. When eating out and you like what you are eating, take a picture, ask for the chef and obtain from the chef the recipe. You like cooking. Do something similar with what you have cooked.